Autumn colours of Hardcastle Crags and the Peckett Well War Memorial. 'The War Memorial at Smeakin Hill to the 33 men of Wadsworth who lost their lives in the war of 1914 ' 1918 was unveiled on 23rd September 1923 by Major Robert H. Barker. 'Roughly based on Stoodley Pike, it is an obelisk 41 feet high (Stoodley is 120 feet) it was designed by the Wadsworth Surveyor Mr Dent Parker and built by Oldfield Watson on land given by Mr Weir of Lower Crimsworth Farm. It has a natural rock foundation. '16 October 2017. Picture Bruce Rollinson''Tech Details: Nikon D4, 80-200 mm Nikkor, 1/800th sec @f9, 400 asa. Not only was the town, known for its old mills and flapjack-like houses, ranked number one in the UK thanks to its great quality of life and culture - it is also in the top five in the world, alongside the likes of New York and Perth in Australia! In a survey carried out by data analytics firm SAS, Hebden Bridge scored highly across all categories, giving it an edge over other popular UK towns. SAS analysed data such as weather, the job market, prices indices, environmental pollution, public transportation and green spaces, combined with indicators for quality of life such as schools, shops and crime levels. Other top locations in the UK included Richmond (Greater London), Hale (Greater Manchester) and Harrow (Greater London). Hebden Bridge also featured in the best seven places globally, ranking at number five behind the overall winner, West Perth in Australia. He told the Todmorden News: “Hebden Bridge people already knew their town was a world-beater. 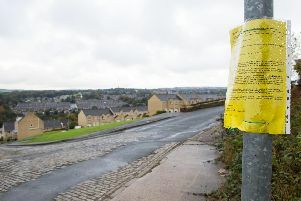 “Now they have a computer analysis to prove it – based on a wide range of public data, much of which is available on our Calderdale dataworks web page (click here). “The town has a great cultural offering and a distinctively independent shopping experience, as well as beautiful countryside, great transport links and a close-knit local community. “It’s already been called ‘Fourth Funkiest Town in the World’ by British High Life magazine and more recently received a ‘Great British High Street Award’ in the Small Market Town category. “This latest accolade is yet another feather in Calderdale’s cap. “Earlier this month, a similar computer survey rated Halifax as one of the best connected towns in Europe on the basis of its digital connections, broadband coverage and road and rail connectivity. Cllr Pat Fraser, Mayor of Hebden Royd, remembered the Boxing Day floods of 2015 which she said showed the Hebden Bridge community at its cohesive best. “Everyone pulled together and we came out stronger than ever,” she said. “Hebden Bridge is much more than a town, it is a community. “When I first moved to Hebden Bridge, a complete stranger in my street shook my hand and said ‘welcome home’ - it is and will always be. There was praise too on Twitter.